An innovative publisher of Genre Fiction and New Pulp, Pro Se Productions releases today the latest volume from its Pulp Obscura imprint. Formed originally in conjunction with Altus Press, a publisher of top quality Pulp reprints as well as New Pulp, Pulp Obscura focuses on creating new stories with characters first seen in classic Pulp magazines that are now largely unknown. 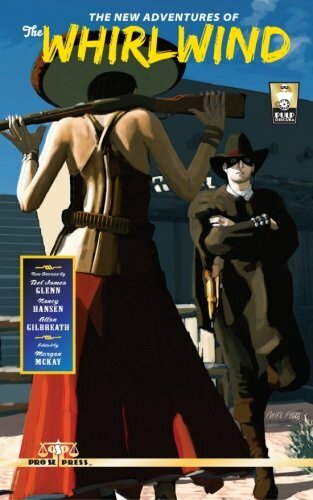 The latest anthology from the line brings new life to a character from the long legacy of Johnston McCulley, best known as the creator of Zorro. Ride the plains once more with another of McCulley’s masked western heroes in The New Adventures of the Whirlwind! A young man leaves behind a life of wealth and privilege in Spain and journeys to California. He builds a new life with a new name, Pedro Garzos. As he settles into his new home, the man known as Pedro discovers tyrant, bandits, and other dangers that threaten the weak and powerless! Rising to the challenge, he assumes one last alias and dons the mask of El Torbellino- The Whirlwind! The Whirlwind now returns and continues his crusade for justice! From out of the past comes new tales of the Wily Whirlwind! Pro Se Productions in conjunction with Altus Press presents a new volume in its Pulp Obscura line! Bringing adventures and heroes lost in yesterday blazing to life in New Pulp Tales Today! Exciting new stories of blazing justice and heroic adventure from Teel James Glenn, Nancy A. Hansen, and Allan Gilbreath! Join the Whirlwind as he takes on new adventures with his friends, Juanita Lazaga, daughter of Carlos the innkeeper, and Friar Marcos, as they fight for the people of Old California! Pulp Obscura Proudly Presents The New Adventures of the Whirlwind! Featuring a fantastic cover by Mike Fyles and cover design and print formatting by Sean Ali, this collection is now available in print on Amazon and via Pro Se’s own store at http://tinyurl.com/ljvvg9b for $9.00. The title is also available as an ebook formatted and designed by Russ Anderson from Amazon, Barnes and Noble, and www.smashwords.com for only $2.99. NEW SINGLE SHOT DEBUTS-ULYSSES KING PROVES ‘DINOSAURS AND NUKES DON’T MIX’!